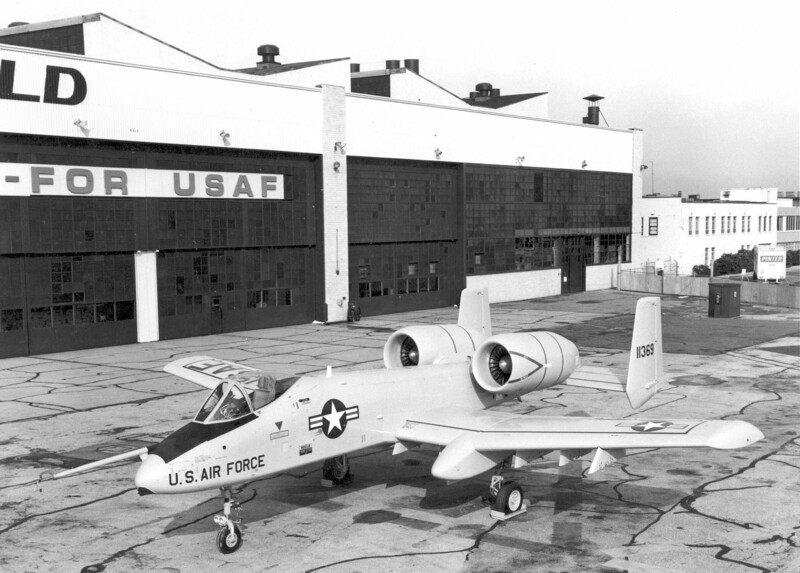 10 May 1972: Chief test pilot Howard W. (“Sam”) Nelson made the first flight of the prototype Fairchild Republic YA-10A Thunderbolt II, 71-1369, at Edwards Air Force Base in the high desert of southern California. The A-10 is armed with a hydraulically-operated General Electric GAU-8 Avenger 30 mm Gatling-type autocannon. The gun has 7 rotating barrels and is capable of firing at a rate of 4,300 rounds per minute. The Thunderbolt II can carry a maximum of 1,350 rounds of high explosive-incendiary or armor piercing-incendiary ammunition. Howard Verner Nelson was born on New Year’s Eve, 31 December 1924, at Hartford Connecticut. He was the second son of Gustaf B. Nelson, a clerk, and Signe Ottilia Nelson. Nelson entered the United States Army Air Forces on 20 November 1944, and remained on active duty in the U.S. Air Force until 28 May 1957, when he transferred to the Air Force Reserve. He rose to the rank of lieutenant colonel. He flew 105 combat missions during the Korean War. “Sam” Nelson joined the Republic Aviation Corporation in 1960. He was assigned Republic’s chief test pilot for the F-105 Thunderchief supersonic fighter bomber. In October 1976, Nelson was promoted to Director of Flight Operations. Nelson was killed at the Paris Air Show 3 June 1977 while demonstrating an A-10A Thunderbolt II. Lieutenant Colonel Nelson’s remains were buried at the Arlington National Cemetery. In 1930, aviation pioneer Louis Charles Joseph Blériot established the Blériot Trophy, to be awarded to an aviator who demonstrated flight at a speed of 2,000 kilometers per hour (1,242.742 miles per hour) for 30 minutes. The technology to accomplish this was three decades in the future. 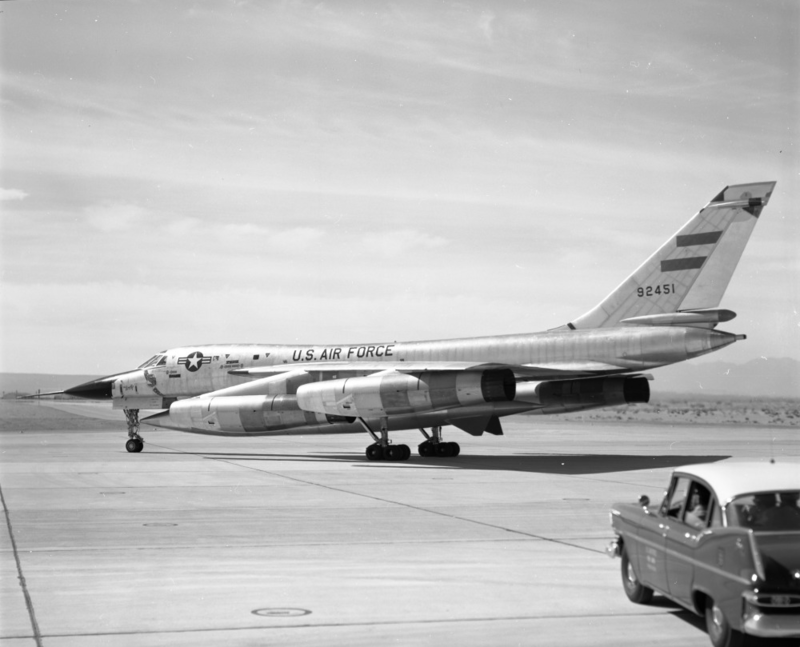 On 10 May 1961, a U.S. Air Force/Convair B-58A-10-CF Hustler, serial number 59-2451, The Firefly, did just that. 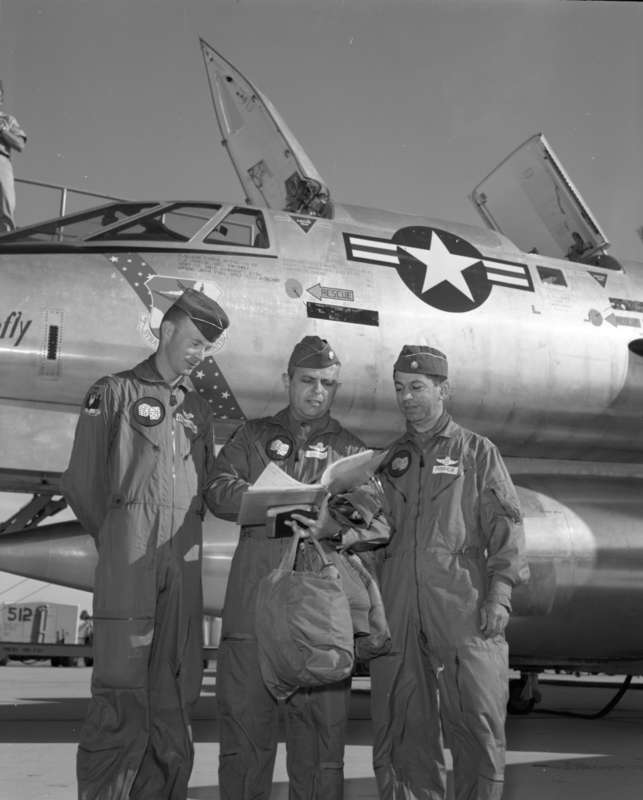 Flown by a crew consisting of Aircraft Commander, Major Elmer E. Murphy, Navigator, Major Eugene Moses, and Defensive Systems Officer, First Lieutenant David F. Dickerson, the Mach 2+ Strategic Air Command bomber flew 669.4 miles (1,077.3 kilometers) in 30 minutes, 43 seconds. Their average speed was 1,302.07 miles per hour (2,095 kilometers per hour). The black and white marble trophy was presented to the B-58 crew by Alice Védères Blériot, widow of Louis Blériot, at Paris, France, 27 May 1961. It is on permanent display at the McDermott Library of the United States Air Force Academy, Colorado Springs, Colorado. Four General Electric J79-GE-5 afterburning turbojet engines, rated at 15,600 pounds of thrust at Sea Level, each, are enclosed in nacelles which are suspended under the wings from pylons. 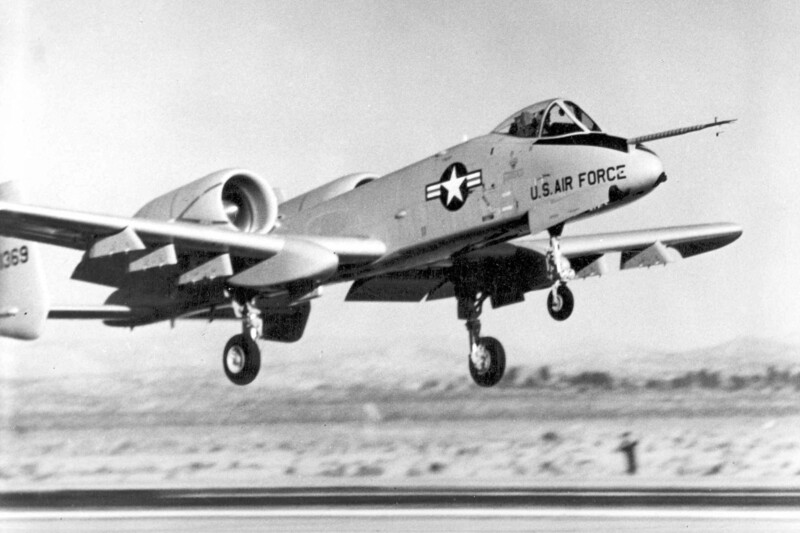 On 26 May 1961, The Firefly, flown by a different aircrew, set a speed record by flying New York to Paris, while enroute to the Paris Air Show, a distance of 3,626.46 miles in 3 hours, 19 minutes, 58 seconds, for an average of 1,089.36 mph. On 3 June 1961, the Blériot Trophy-winning crew of Murphy, Moses and Dickerson departed Le Bourget Airport aboard 59-2451 for the return trip to America. 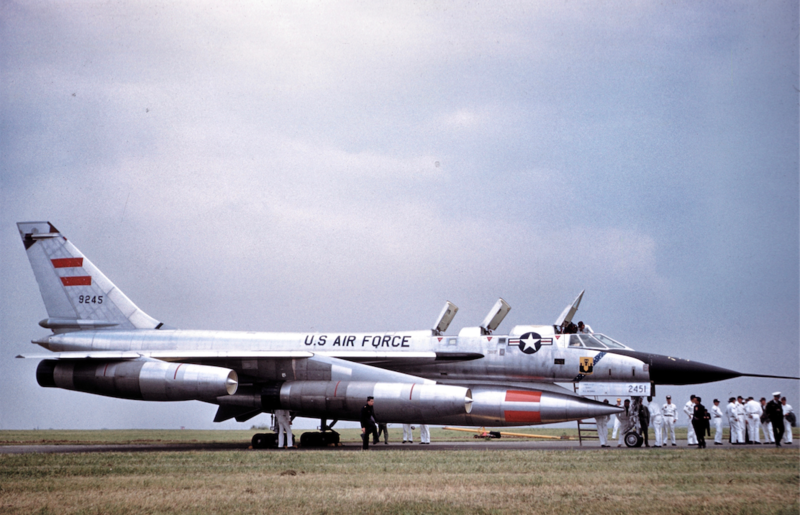 The B-58 crashed five miles from the airport. All three men were killed and the aircraft totally destroyed. 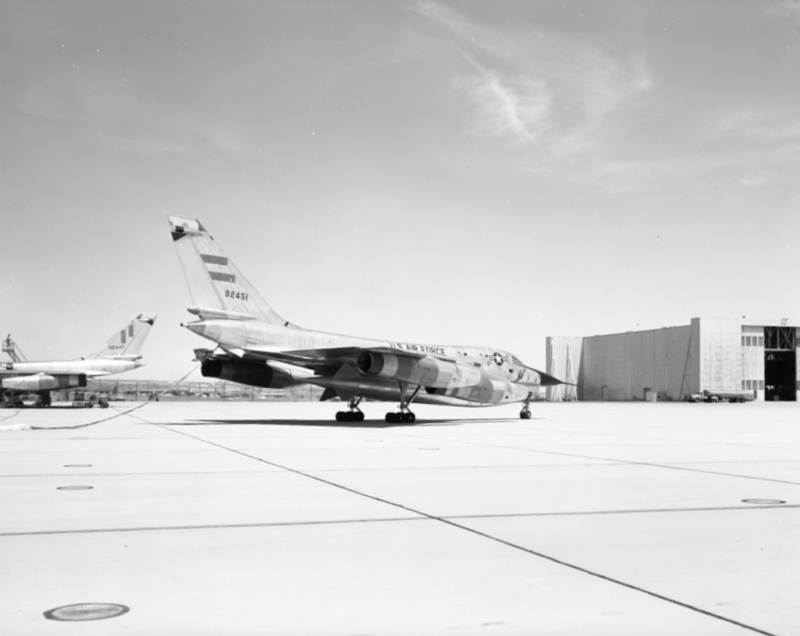 Convair B-58A-10-CF Hustler 59-2451, The Firefly. 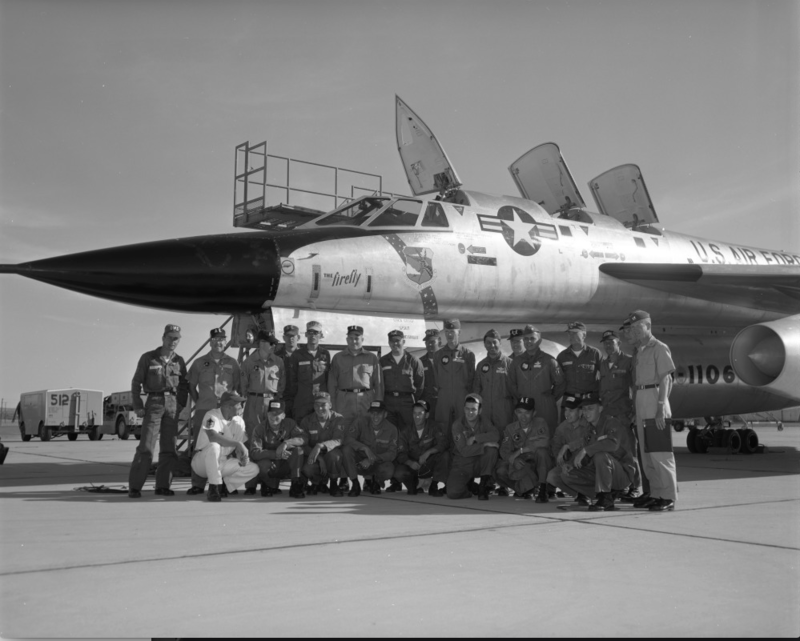 General Dynamics contributed an extensive collection of photographs of the speed run to the San Diego Air and Space Museum, which holds them in its Archives. 10 May 1927: At 3:55 p.m., PST, Charles A. Lindbergh and his Spirit of St. Louis lifted off from Rockwell Field on North Island, San Diego, California, for their record-setting overnight flight to St. Louis, Missouri. 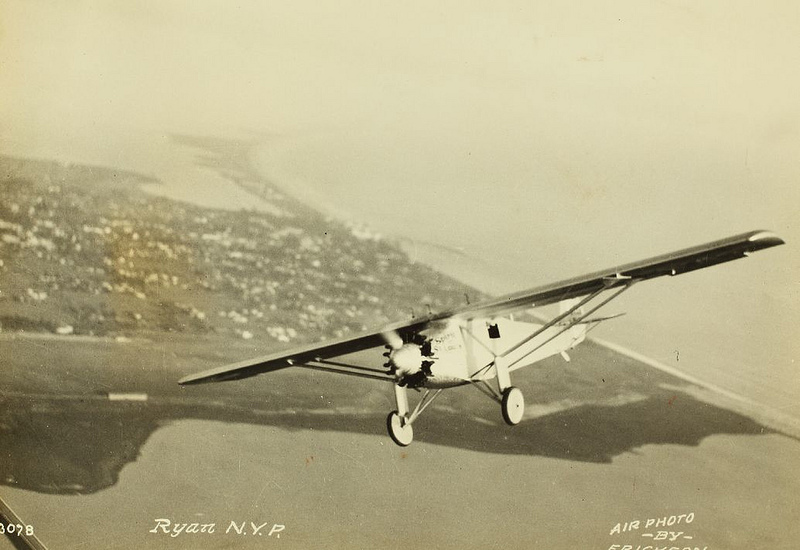 The new Ryan NYP, N-X-211, had been ready and all the flight tests complete since 4 May. Lindbergh had completed the navigational planning for both the transcontinental flight to New York City, and then, the transoceanic flight to Paris. He had been in daily consultation with Dean Blake, chief of the Weather Bureau in San Diego. 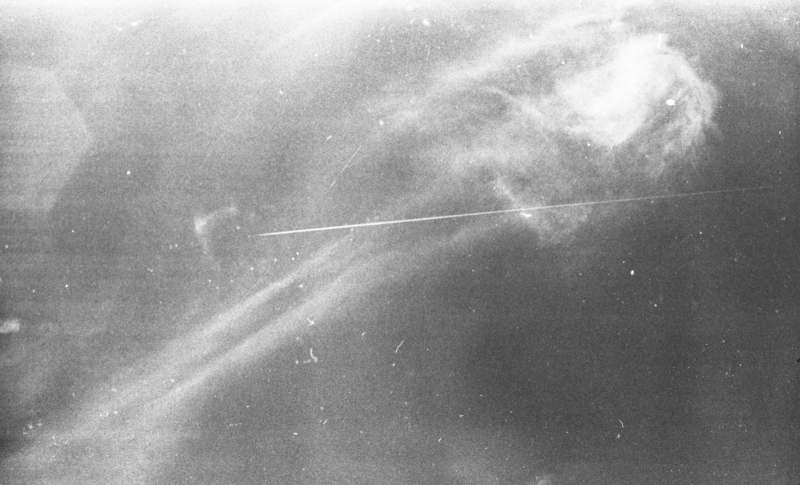 A system over the Rockies had been holding up his departure for days, but now everything was ready. “At 3:40 I crawl into my flying suit. It’s uncomfortably hot in the California sun. . . It’s a few minutes early, but why wait any longer in this heat? I wave good-by, taxi into position, and ease the throttle open. As I pick up speed, I hold the tail low to put as much load as possible on the wings and reduce strain on the landing gear. 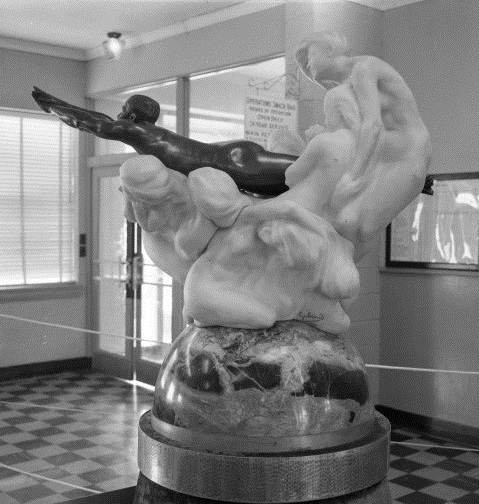 — The Spirit of St. Louis, by Charles A. Lindbergh, Charles Scribners’ Sons, 1953, at Page 134. 10 May 1911: Second Lieutenant George Edward Maurice Kelly, 30th Infantry Regiment, United States Army, was killed during his primary pilot qualification flight at Fort Sam Houston, Texas. 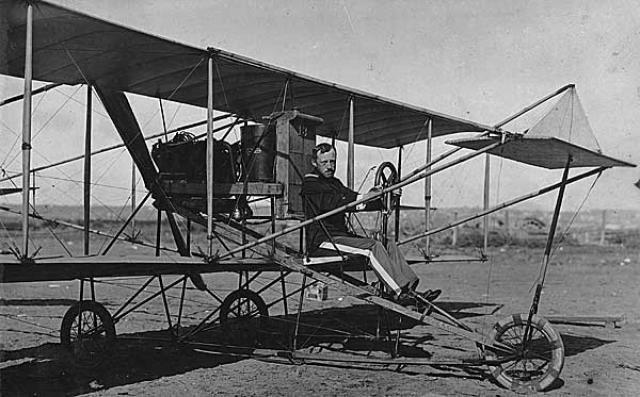 Kelly had been sent to San Diego, California, in January 1911 as one of three U.S. Army officers to attend Glenn H. Curtiss’ Curtiss School of Aviation, newly established on North Island. After three months of training he was sent to Texas where the Army had set up its own training field. 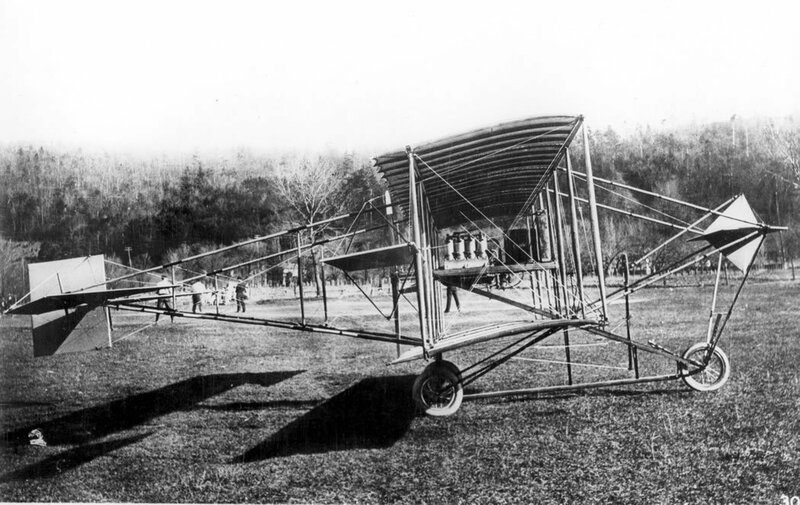 Lieutenant Kelly was flying the Army’s second airplane, S.C. No. 2, a Curtiss Model D Type IV. The airplane had been accepted just two weeks earlier. Army Airman Suffers Fractured Skull in Fall at San Antonio and Dies and Hour Later. Only Up Five Minutes When Mishap in Control Equipment prevented His Shutting Off Power. SAN ANTONIO, Texas, May 10.—Second Lieut. George E.M. Kelly of the United States Signal Corps, one of four army aviators on duty with the division of regulars mobilized here, was killed this morning when a Curtiss aeroplane he was flying got beyond control, after which it ran through the air for over a hundred yards, and crashed to the ground, burying Lieut. Kelly in its wreckage. The machine was reduced to splinters, the only parts of it left intact being the engine and the rear plane work. Lieut. Kelly suffered a fractured skull and died in the Fort Sam Houston Hospital an hour later. He never regained consciousness. The accident happened about 7:30 this morning, in full view of Gen. Carter and his staff and hundreds of soldiers. The exact cause of the accident will probably never be known, although a board of officers from the Signal Corps who investigated the accident are of the opinion that it was due to a break in some part of the controlling mechanism, making it impossible for Kelly to shut off the power when he realized his peril. The accident happened about one hundred yards from Gen. Carter’s headquarters. The young officer had been in the air about five minutes, and Major Squier, Chief Signal Corps officer, had commented on the fine flight he was making, when the aviator pointed his machine downward for the purpose of making a landing. The machine was going at a speed estimated at between forty and fifty miles an hour. It shot down, apparently under perfect control, and landed a few feet away from one of the main driveways that intersect the mobilization camp. Kelly could be seen working frantically at the steering wheel as the machine descended, and when it struck the ground everybody breathed a sigh of relief, believing the officer was safe. But the unexpected happened. The machine ran along the ground for ten or fifteen yards and then the fork into which is fitted the front wheel struck some obstruction and a moment later the propeller began to revolve at a wild speed. It could be seen that the left part of the machine was absolutely beyond the control of the aviator. It suddenly shot forward several yards, and then ascended to an altitude of between fifteen and twenty feet. It darted through the air in the direction of the Eleventh Infantry camp, tumbling and rolling like a wounded bird. The officer could be seen working the broken controller, but those who witnessed the sight say that at no time did he have a chance to escape with his life. The machine gave a last tumble in the air and fell with a crash to the ground. Kelly was pitched out just as it started downward. The aviator and the machine struck the ground at the same instant. Photograph of the accident scene at Fort San Antonio, published by the San Antonio Express, 11 May 1911. Major Squier, Lieut. Foulois, Frank Coffyn, the Wright aviator, and a trooper were the first to reach the side of the dying aviator, whose skull was crushed. He lay under the wreckage of one of the planes, his face to the ground. The ambulance came up a moment later. Lieut. Foucar of the Medical Corps, in charge of the ambulance, examined Lieut. Kelly and informed Major Squier that he was mortally hurt. By this time the Third Cavalry galloped up and formed a cordon around the place where Kelly lay dying. Lieut. Foucar, aided by troopers, picked him up and hurried him to the hospital, where Major Hutton, the Chief Surgeon, after examining him said there was no chance to save his life. An hour and ten minutes later he died. Others new when Kelly was killed, besides Gen Carter, were Col. Stephen Mills, Chief of Staff; Lieut. Col. Ladd, the Adjutant General, and Col. Birmingham, Col. Straub, Capt. Leonard and Capt. Craig, all of the division staff. The whole camp knew of the accident within a few minutes after it had happened, and on all sides the deepest feelings of regret were expressed for the unfortunate aviator, who was one of the most popular members of the army corps. 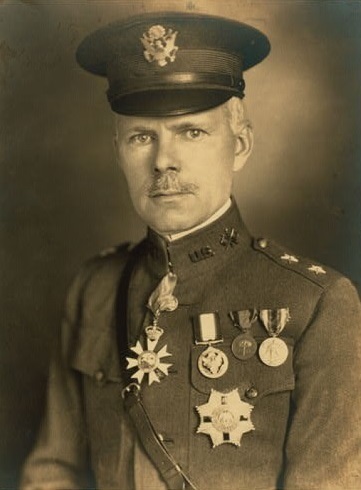 Major General George Owen Squier, Signal Corps, United States Army. As soon as order was restored Major Squier appointed a board of three signal officers to investigate the accident. Lieut. 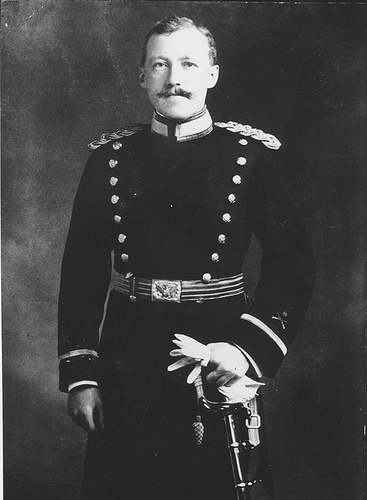 Paul W. Beck, chief of the corps, was President of the board, the other members being Lieut. Fulois and Lieut. Walker. 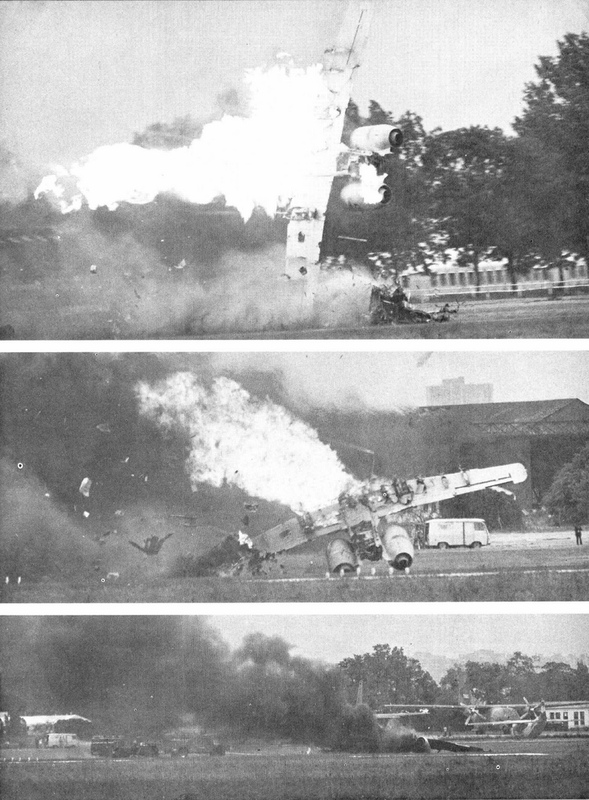 After a hearing that lasted several hours they reported that atmospheric conditions were good at the time of the accident, that Kelly’s first landing was a good one, and that the cause of the accident was due to a break in some part of the control equipment which made impossible the management of the engine and planes. The report has been forwarded to Gen. Allen, Chief of the Signal Corps, in Washington. The accident to Lieut. Kelly is the third within the last ten days. All of them befell the same Curtiss aeroplane in which Kelly was flying. Lieut. Walker figured in the first accident. On that occasion, in making a turn, the machine got out of his control and fell 150 feet before it righted itself. Lieut. Beck was the victim of the next accident. He fell over 200 feet and landed in a mesquite tree. The machine was badly wrecked. When Lieut. Kelly went up this morning it was the first time the machine had been in the air since its mishap with Lieut. Beck. Lieut. Kelly came to San Antonio about six weeks ago with Lieuts. Beck and Walker. All had been receiving instruction from Glenn H. Curtiss at San Diego, Cal., and had certificates from Mr. Curtiss testifying that they were capable aviators. When the Curtiss machine arrived several weeks ago Eugene Ely, one of the Curtiss aviators, was sent here to look after the instruction of Lieuts. 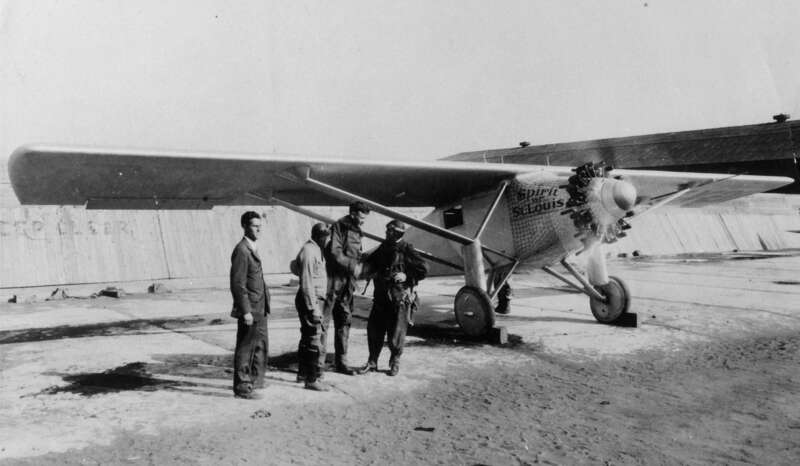 Beck, Kelly, and Walker, who had been assigned to fly the machine. Ely left ten days ago to fulfill some exhibition engagements, and is not due back until May 14. Speaking of the accident this afternoon, Major Squier said that, in his opinion, it was unavoidable. Lieut. Kelly was a native of England and joined the army in 1904 as a private in the Coast Artillery. He held every non-commissioned rank from Corporal to Sergeant, and was commissioned a Second Lieutenant in the Thirtieth Infantry in 1907. He was unmarried and is said to have a sister living in New York City. His parents are believed to be in England. Lieut. Kelly was the second army officer to be killed in an aeroplane. The other was Lieut. Thomas B. Selfridge, who fell with Orville Wright at Fort Myer, Va., in September, 1908. Second Lieutenant George Edward Maurice Kelly was the second U.S. Army aviator killed in an airplane accident, however he was the first pilot killed while flying his own airplane. His remains were interred at the San Antonio National Cemetery, San Antonio, Texas. 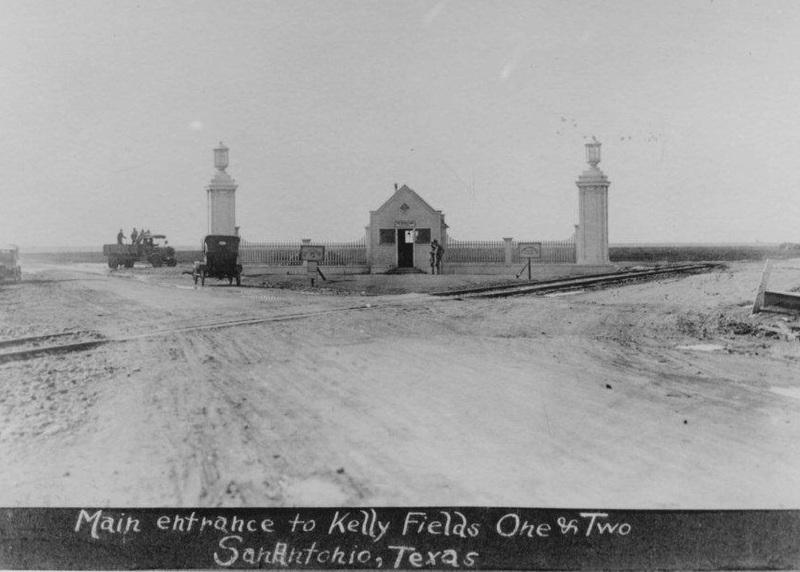 In 1916, the Army replaced the air field at Fort San Antonio with a new field on the opposite side of the city. The new airfield was initially named Camp Kelly, then Kelly Field. In 1948, it was renamed Kelly Air Force Base.